Wood Pellets are the new generation of wood fuel. Wood fibre is dried and Densified into cylindrical pellet 6-10mm in diameter. These wood pellets are similar in appearance to stock feed pellets. By processing the wood fibre into Densified Wood Pellets the energy output is concentrated. This effectively means a ton of wood pellets has an energy value up to 40% higher than traditional firewood. 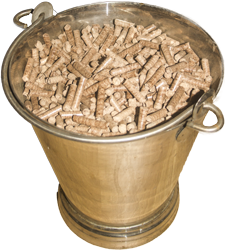 Wood Pellets are burned in specially designed wood pellet heaters. These wood pellet heaters are automated and use mechanical feed system and fans to insure the optimum combustion of the wood pellet fuel. By creating the optimum burning conditions we can produce the lowest possible emissions and ash residues for the wood pellet fuel being burned. The user can set their desired room temperature or set up the wood pellet heater to run on a timer maximizing the value of the wood pellet fuel. The wood pellet heaters are fitted with automatic ignition so there is no requirement for fire starters. This improves the economy of the wood pellet heater. Ecofriendly Solutions offer three options of Wood Pellet Heater.